Livia is in a foster home getting lots of love and they have renamed her Mochi. Here you can see Mochi enjoying a relazing yoga session with one of her foster moms! Hi. My name is Livia and I am a very pretty, spirited and spayed lop girl. Even though I think of myself as a hot-looking,young girl my pronounced dewlap (bunny double-chin) and my mature, curvy look is a pretty good indicator that I have some mileage on me and I am a middle-aged+ bunny. I have a good attitude about life even though I likely wasn't treated particularly well before I arrived at SaveABunny. I can be a bit bossy and opinionated,though I really do love to get your attention. I'd just prefer you not move my stuff around a lot, since I put a lot of thought into my decorating. Also, I am looking for some one very special to bring me home. 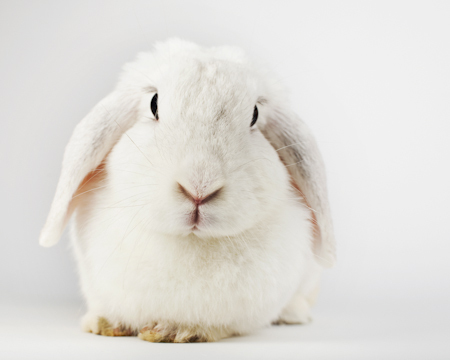 When I was spayed at the shelter, I received the bad news that no female bunny wants to get. As an unspayed girl, I had an 80% chance of having uterine cancer and that's what the doctors found. They did the best they could to get the abnormal tissues out, but it may have already spread. We really don't know. So, it's kind of sad and bittersweet that I now feel safe and loved and optimistic about finding a human to be nice to me. However, prognosis is very guarded and it's possible I may only have months or a year or so to live. I am hoping that you can find room in your heart and home to give me a second chance at being treasured and loved in my life--even if my future is unknown. I eat like a champ and don't show any signs of illness, but if we are going to be soul mates I want you to go into this new stage of life with me with both your heart and spirit open to whatever my path will be. Won't you please visit me soon, kiss my cute buns and give me some love and respect?